Feedback is so good for the heart :) - Emmett Technique Cairns Muscular Release Therapy, Australian made. It is always so lovely to receive feedback, it helps you believe in yourself and the technique that is behind you. 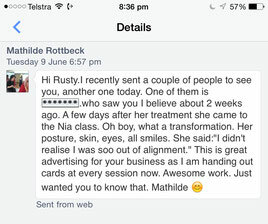 If you have not heard of Nia in Cairns or met Mathilde, visit her facebook page. Nia is a fun expressive movement practice that leaves you feeling energised and alive. Blending the latest mind body science with ancient wisdom, Nia guides and inspires us to live and move sustainably in a body.